I haven’t done any real cooking in our Austin kitchen yet, but this homemade Thai pineapple dish is looking pretty tempting after all the tacos I ate yesterday! I’m determined to eat all the tacos in Austin. Back to Thai food. 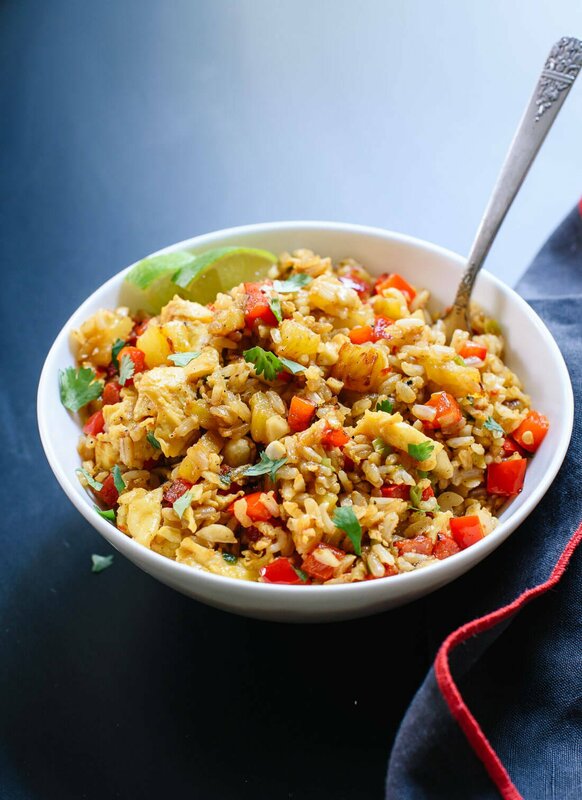 This pineapple fried rice recipe was inspired by a meal at Sweet Basil in Norman, Oklahoma over the holidays. I really loved the combination of sweet, caramelized pineapple with Thai spices. I can’t claim that my version is traditional, but it does taste very close to my memories of that dish. I used some leftover bell pepper instead of tomato and thought it was pretty great that way. 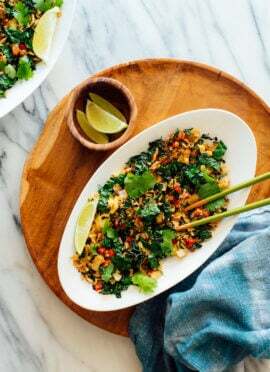 The cooking method for this fried rice is a riff on my spicy kale and coconut stir fry. If you’re a fan of that recipe, I think you’ll love this one, too, as well as my veggie fried rice and the coconut fried rice in my cookbook. Please let me know how it turns out for you in the comments! This meal comes together very quickly, so make sure your ingredients are ready to go before you get started. Chilled leftover rice works best in stir fries because it doesn’t clump together, so cook the rice in advance if time allows (see recipe notes). 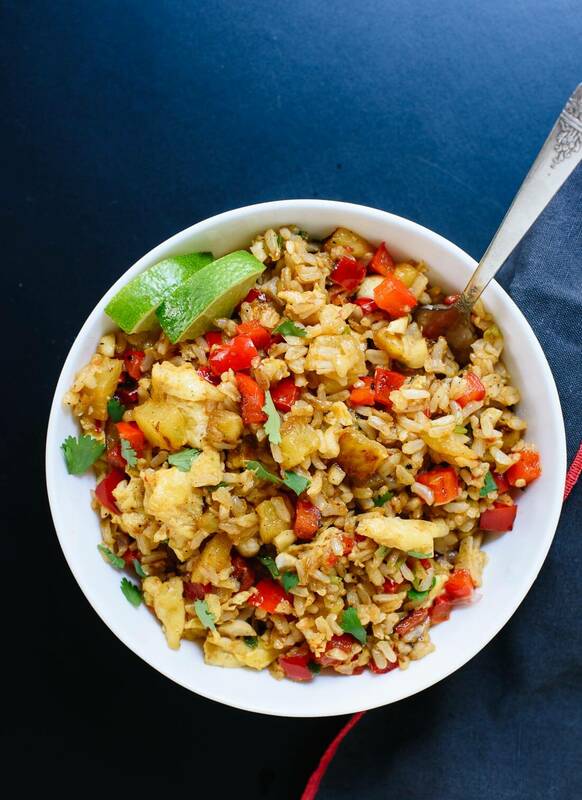 Thai-style sweet and spicy pineapple fried rice with red bell pepper, cashews and cilantro. This is a healthy and quick, vegetarian weeknight dinner! This dish comes together very quickly, so be sure to have your ingredients (including chilled leftover rice) prepped in advance. Recipe yields 2 large, restaurant-sized portions or 4 more modest portions. Recipe adapted from my spicy kale and coconut stir fry. *Rice notes: For 2 cups cooked rice, you’ll need to cook up about ⅔ cup dry rice. To cook the rice, rinse it well in a fine mesh colander, then bring a large pot of water to boil. Add the rice and let it boil, uncovered, for 30 minutes. Drain off the remaining cooking water, then return the rice to the pot. Cover the pot and let the rice steam, off the heat, for 10 minutes. To chill the rice ASAP, spread it across a parchment paper-lined rimmed baking sheet and let it cool in the refrigerator. MAKE IT VEGAN/EGG FREE: Skip the eggs by heating the pan and then start cooking with step 2. 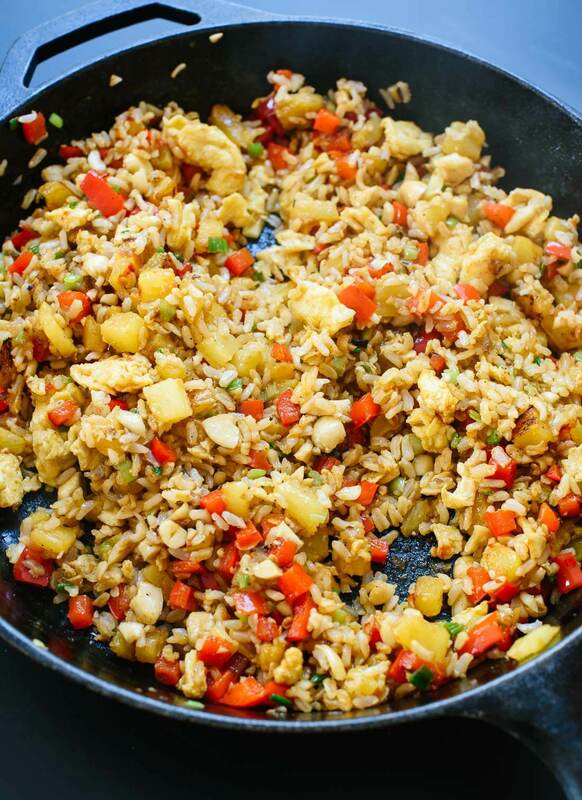 This fried rice would be great with crispy baked tofu, which you could toss in during step 4. MAKE IT GLUTEN FREE: Make sure to use a certified gluten-free soy sauce (tamari is usually gluten free, but check to be sure). STORAGE SUGGESTIONS: The dish tastes great the next day, whether reheated or served at room temperature. I’m so glad I found your blog (by googling “meatless meals”)! I can’t wait to try out some of these recipes for my family. :) This looks so yummy. I hope you do, McKenzie! So happy everyone enjoyed this, Janet! Do you have the calorie counts for your recipes? I love the thai-pineapple-fried-rice and curious about that particular one and some others you have. Unfortunately I’m little and have to count calories. Hi, Kim! Unfortunately, I don’t have nutritional info available for my recipes just yet. I’m looking for a solution, and will update about it once I find one. Thanks! I started with some sautéed onions & a Thai chili pepper. I omitted the egg & served with crunchy fried tofu! I can’t wait for lunch today!! Thank-you for sharing this amazing recipe! That sounds delicious, Lindsay. Thanks so much for commenting! Yum, thank you. This made a lovely dinner tonight that the whole family enjoyed! Oh, I’m so glad you tried it, Tricia! I love the sweet and salty combination of the two. This was amazing! It came together really quickly and had the perfect balance of flavours and textures. I love how the juicy, caramelized pineapple blends with the sriracha and soy. Kate, your recipes are so detailed and easy to make. My only complaint is that I didn’t stumble upon your site sooner – I can tell that I’m going to be making a lot of your recipes over the coming weeks and that I’m going to find a lot of favourites to put in my rotation. This is all so kind of you, Sarah, thank you! I’m so happy you found my blog. This was delicious! I omitted the eggs, and I added a caramelized onion, baby spinache, and edamame for more veggies. So flavorful! Sorry this was disappointing for you, Lisa. Thanks for answering. To be fair I didn’t give a review on a recipe I loved- the pho soup! Was amazing. And when I had the leftovers of this pineapple rice I first sautéed spinach and added it with the liquids and it tasted a lot better. I will try more recipes! So, I was wondering: do you think this recipe could work with canned pineapples? One more time, thank you very much to bring and share delicious recipes. I can always trust that, if I follow the recipe, it will turn into something delicious! You’re one of the responsibles to bring me much more to the vegetarian side. Thanks to your delicious recipes I drastically decreased my meat consumption! I think canned pineapples would be just fine, Graciely! Look out for ones with a ton of added sugar, though. Other than that, it should turn out well! I made this recipe, it was delicious. My hubby dislikes brown rice so I used white, but don’t recommend it since it is so sticky. The flavor of all the ingredients were awesome. Thanks for sharing. Another phenomenal recipe from Cookie & Kate! Can barely wait to get it out of the pan before I start devouring it! I hope you loved it, Sarah! Made this dish tonight, the texture & taste were great! My husband thought it was the best rice that he has eaten! Perfect! Thanks, Zona. I’m so glad the two of you enjoyed it. Loved this! It’s the perfect base for creating variations using your favorite vegetables, fruits, and even meat (for the non vegetarians). Thank you! You’re welcome! This is a great whatever-you-have-on-hand type of meal! So delish! I shared this with so many people at my work. Thanks! Thanks, Nicki! And thank you for sharing it, too! I totally ate this up, but I did need to add more sriracha and soy sauce. I feel like maybe adding some dry spices could give it more flavor instead of having to resort to sauces. I say go for it! Let me know which spices you add. Just made this – love it! Was so good. What a delicious dish!! My mom surprised my boyfriend and with this when we moved to Edmonton from Toronto. I can’t have gluten or dairy and I’m vegetarian, and my boyfriend is vegan, so finding your blog has become an invaluable resource to our family! Trying your green Thai curry recipe tonight and I can’t wait to see how it turns out! Thanks so much!! We love this recipe! I made it for dinner last night and it was a big hit. 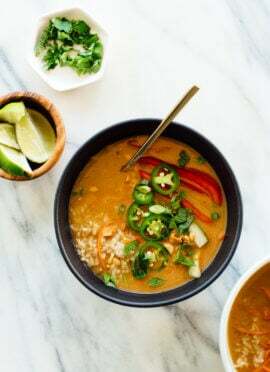 My husband and sons enjoy Thai food, so I knew this would be a good recipe to try. Thank you for sharing it. I will be trying out some of your other recipes, too, and keeping your website in my favorites. I enjoy hearing recipes are a hit for the whole family! Thank you, Marybeth! This recipe has become a staple in our home — we absolutely love it exactly as it is. It’s a great option for Meatless Mondays; it always leaves us feeling satisfied! Meatless Mondays! The vegetarian in me loves this campaign :) I love that this is now a staple for you. Thanks so much for sharing, Anna! Just made this, sooo good! I added about 1 cup of snow peas for some extra green and crunch. Thanks Kate! I made this and it was a hit with both my husband and me!! I made the recipe as it, but added in some tofu that I made in the Actifry with sesame oil. This one’s definitely going in the rotation! Win! Thank you for your comment and review, Sarah. Good recipe – added fresh ginger, used small dice 1/2 Vidalia onion instead of going to store for green onion, and added a couple drops of fish sauce since I had it on hand. Used brown rice too. Doubled recipe. Everyone liked it. No leftovers. No leftovers?! That’s great! Happy it was a hit, Mary. Thank you for your review and comment. Quick and easy to prepare, and delicious!!! You can leave them out if you would like. Otherwise, I would recommend adding chopped almonds instead if you still want the crunch and additional protein. This is the third recipe we made from your blog this week. Three for three- delicious!!!! Third?! Well, thanks so much for the support! I’m glad you have been happy with them. I absolutely LOVE this recipe!!! I have made it time and time again. I had friends from Philadelphia visit last week. They prefer vegetarian meals, so I pulled this recipe out. It was a hit with them. They are now hooked on your site as well. Love to hear that, Kathy! Thanks for sharing and for your review. This is the best fried rice I’ve ever made! It’s so flavorful and simple. I used sesame oil and added some snap peas I had on hand. Thank you for all your easy, healthy and delicious recipes! My brother is allergic to nuts and soy. I am going to skip the nuts in this but what do you think I could use to replace the soy sauce? Would Worcestershire sauce work? Coconut aminos can be a good soy-sauce substitute as well. Also rich in omegas! Thanks Kate for this yummy inspiration! 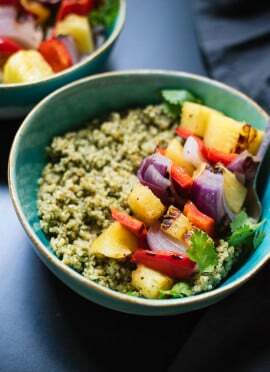 I just made this for lunch and substituted quinoa for the rice and mango for the pineapple. It was really good, easy and quick! I love pineapple fried rice. I was so excited about making this, you have no idea. We just had it for lunch and we all agreed that it was missing something. There was hardly any actual rice in the dish, most of it consisted of pineapple and pepper chunks. Then there was the rice itself. It really lacked in flavor. And I even substituted toasted sesame oil for half the coconut oil. I followed the recipe EXACTLY, and once we had tried it, I added more soy sauce and sriracha to my bowl. This improved it, but it still needs something, as it is really lacking in flavor. The texture isn’t the best either, as it’s mostly vegetables with some rice added in. Overall, the flavor was OK, and I may make this again, with some serious changes. I made it in less than 20 minutes and I like that it’s made of “real” ingredients, not processed junk. I’m sorry you were disappointed. If you prefer more rice, you can always adjust the ratio. Made and loved! I couldn’t find cilantro and added some chicken for my carnivor fiancé. Definitely will keep making this recipe. Thank you! You’re welcome! Thanks for stopping to comment and review. Great! Thank you, Jacqueline for sharing and for your review. I appreciate it! I came across this recipe looking for tofu recipes, and then got so excited when you mentioned Sweet Basil! I went to college at OU in Norman, and THIS was the dish I got there! Needless to say, I’ll be making it soon! Great! Let me know what you think, Carley. I prepared Thai Pineapple Fried Rice at our cabin and it was a huge hit! I stumbled upon your recipe on Pinterest, fell in love with your blog and checked your cookbook out from the library last night. There were so many good recipes to try I ordered my very own copy this morning. I love this recipe and wondering if I can freeze portions for other days / nights during the week. Guessing the cashews need to be added during the cooking process each time. Hi Natalie! I don’t freeze all my recipes, but you could look through comments to see if other readers have had success. And yes, if you do I would not add the cashews. Thanks so much for your review! I hope this recipe and the blog are a good resource for you! Great! Thanks for your review, Rod. I loved this and it was a big hit with my family. Because I didn’t use eggs, I added some chopped roasted and salted macadamia nuts and dried coconut flakes. This recipe was a big hit. Looking forward to trying more of yours! I’m happy it was a hit, Kim! Thanks for sharing your version. I appreciate the review. I’ve made this recipe 5 times now and love it, even though there are so many dishes to wash afterward. Thank you! Just made this because I had a pineapple I needed to use and a broke college student always has rice on hand. It was absolutely incredible. I used frozen yellow and red peppers and it still worked perfectly. Also I mixed soy sauce into the eggs and then poured it over the rice to scramble it in the pan (SUPER GOOD). I was thinking ginger might be a good addition too! Love it! Thanks, Anna for sharing and for your review. Hey Kate….How did you know? All my secret favorite ingredients in one recipe. I use pineapple, cashews, and/or ginger to electrify so many recipes. Thank you for this great recipe idea. In the future, consider adding whole black mustard seeds in step one. Loved this. I think it could also be made with rice noodles. Very easy too. I made this Thai Pineapple fried rice and combined this and two of your other recipes, the crispy baked tofu and extra veggies f/r. The results were delicious. Used my own sauce which was sugar, tamari, sesame oil, garlic and ginger paste, shaoxing, my fermented garlic/chili hot sauce. Added a bag of frozen par steamed Asian stir fried veggies in addition to the pineapple, & extra diced onion and garnished with sliced scallions. I love the creativity! Thanks for sharing, Diane. I haven’t made this yet but will next week when I have $. I will use vegan flax eggs and let you know the result. 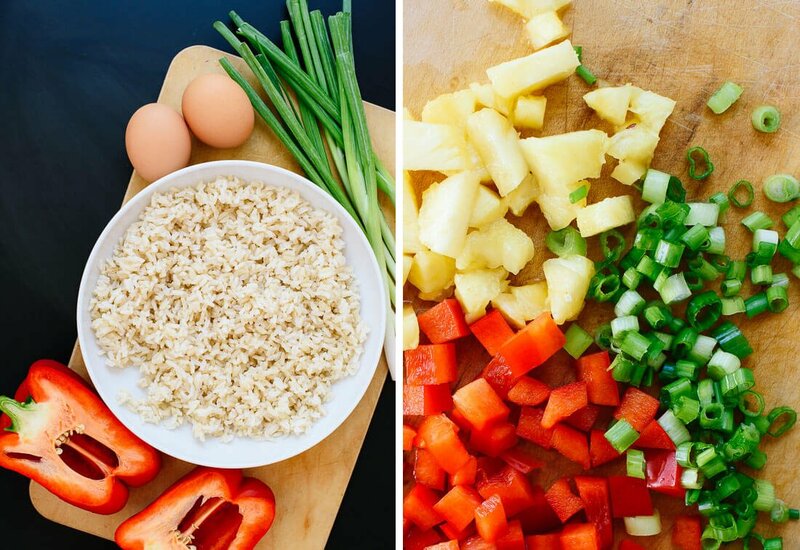 I spent hours looking at pineapple fried rice recipes before picking this one… and I’m so happy I did. This was delicious. I added 2tsp yellow curry powder to the soy sauce and tossed in 1/2 cup of edame. I’ll definitely be making this again. Thank you! You’re welcome! I’m happy you found it too, Nicky. I’m happy to hear that, Jennifer! I loved the simplicity and especially how bright/beautiful this was! It needed something—everyone in my family chose to add their own touch—more lime, more pineapple, more soy, etc. Thanks, Kristen! I love the personal touch idea. What would you serve with this to make it a complete (vegetarian) meal? Do you think there is any way to veganize this one? Could I skip the eggs or use something else in place of? Thanks for any advice – looks so yummy! You could omit the eggs and the 1 ½ teaspoons oil that goes with them. For extra protein, you could mix in 1 cup edamame (thawed if necessary) or a batch of my crispy baked tofu with the cooked veggies at the end. Soooo yummy! My meat eating husband loved it and it was super easy to make. Thanks for the great recipe…can’t wait to try more from your website. You’re welcome! I’m glad your husband loved it. Maybe next time the little ones will, too! Followed this recipe exactly (except subbed the cilantro for basil) and it turned out AMAZING! So much flavor was packed into each bite. Made it for a date night for me and my boyfriend and it did not disappoint. Also, the colors were beautiful! We finished the whole thing (we had it as an entre), but I wish i had leftovers. Will definitely keep and make again. Made according to the recipe, and it was bland. Added more soy and sriracha and it was a little better. It seems like it needs a little something more. Sorry. I’m sorry you didn’t love it. But thanks for the feedback! Could use a little more flavour to improve. Maybe add a different spice? I’m sorry you didn’t love the ratio! You could always add more of your favorite already included. Did you add any hot sauce at the end? When do you add the garlic? Did I miss it? I just made this tonight. My family and I loved it. Thanks so much!! Look forward to making it again.